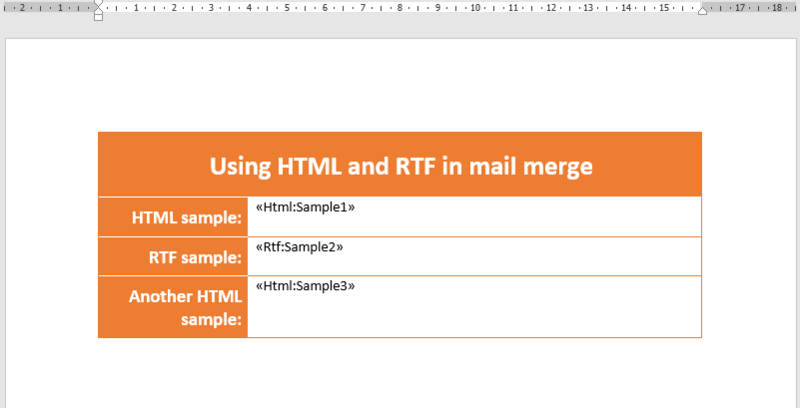 The following sample will demonstrate how you can insert HTML and RTF formatted text in a mail merge process. Additionally, this sample will demonstrate how to use a FieldMappings collection together with FieldMerging event to define custom MergeFields. This will be done by specifying an arbitrary prefix (such as "Html:", "Rtf:", etc.) for the MergeField's name and then implementing merging customizations for the appropriate MergeFields. Fields with an "Html:" prefix will insert a HTML formatted text from the provided string. Fields with an "Rtf:" prefix will insert an RTF formatted text from the provided string. // Map merge fields, e.g. "Html:Sample1" field's name to "Sample1" data source name. // Customize mail merge operation with a support for our custom prefixes. // Delete paragraph which contained field, do this if we're loading block level elements like one or more "p", "div", etc. tags. // Execute mail merge operation, for demonstrations purposes we'll use a simple anonymous type as a data source. Sample3 = "<p style='text-align:right'>Sample 3 [HTML]</p>"
' Map merge fields, e.g. "Html:Sample1" field's name to "Sample1" data source name.
' Customize mail merge operation with a support for our custom prefixes.
' Delete paragraph which contained field, do this if we're loading block level elements like one or more "p", "div", etc. tags.
' Execute mail merge operation, for demonstrations purposes we'll use a simple anonymous type as a data source. This works well, except the font face get's lost. 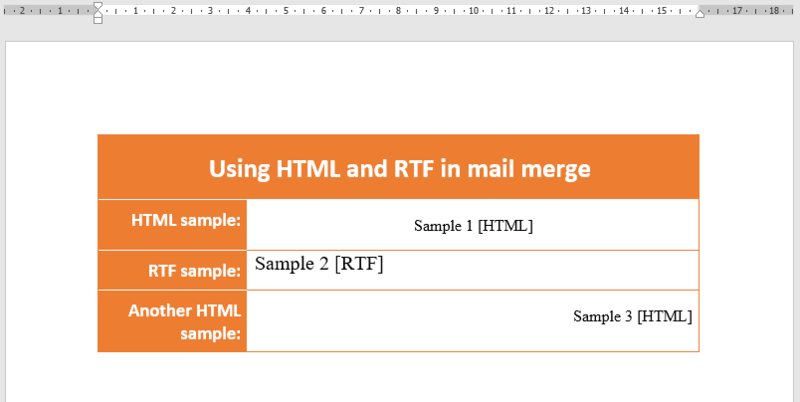 So bold, italic from the html appear in the word file, but even though my template en the specific merge fields define Calibri as the font, the merged text will be in Times new roman. Is there any way to for the entire document to use the same font face? Currently, only when using "LoadText(String)" the loaded content will have an inherited formatting (for example, in your case it would inherit the MergeField's formatting). But when using any other LoadText method, in which you're explicitly specifying the formatting that should be used, then a new content will be generated from the specified input text and the provided format. In other words, when using "LoadText(String, HtmlLoadOptions)" the new content is being generated based on only the provided input HTML text, it does not matter what MergeField's formatting is. Nevertheless, you could try using something like the following in order to obtain the desired inheritance. Thank you for your prompt reaction. Unfortunately the [style] directive rendered literally in my document. It did inspire me to a bit different solution though. See below. Basically I added a div around my content with the desired style info. Thank you again.